Sundance is a responsive WordPress theme designed for hotels, bed and breakfast, hostels, resorts and any other type of service which requires a booking type system. Sundance comes also with free customer support and after purchase service. Sundance offers a rock solid theme back-end with tons of useful tools, functions and options. Change the look and feel of your site in secondes, with only a few clicks. Sundance comes with Demo XML file, just import it to get the demo site content. 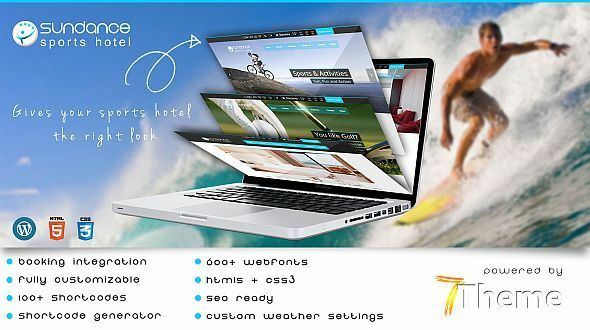 The theme is specially build for hotels, cottages, rental apartments, spa and similar. We’ve included a bunch of shortcodes, webfonts and widgets to give you even more freedom when managing your hotel site. Sundance is ready to use from the box. Quickly install it via FTP or WordPress and after you activate it you can load demo content. Then you can add your own content on already designed pages.